I own two Singer 221-2 Featherweights, a black one & a 'white' one. (They say the white ones are really green). Anyway, the belt on my black machine worked perfectly, whereas the belt on my white one was another story. However, it would be a long time before I even realized that in fact the issue was the belt. Ever since I purchased the white machine off eBay I noticed that the belt seemed to slow the motor down considerably, and no matter how I tried to adjust it, nothing helped. So I bought a new black belt, then a black stretch belt, and neither made a difference. So I put the machine away, only to visit it maybe every 6 months. I recently pulled the machine out for its usual drop of oil here and there so it didn't petrify in storage when I decided to try again. I just couldn't give up on this little machine. Quitting is not in my blood. So, in my new research I read that an orange toothed lug belt was suppose to be better for this model machine, so I bought one of those. Well, all this orange toothed belt did was slip! It was not soft like you think it should be, it was a hard plastic, no gripping to it at all. No amount of adjusting helped whatsoever either. I was stumped; I simply did not understand what was going on here. At first I thought the belt was not long enough. So I made a belt out of a new treadle belt, which was too wide and didn't work. At times I felt like sending the machine airborne. I didn't understand what the issue was. I mean it's not hard to adjust the belt. There is even a great video on how to do so, in which I watched over and over, thinking I missed something; but I didn't. In fact I've never had this issue with any machine I've ever worked on. I even thought about selling this machine, but I couldn't sell it like this, every machine I sell has to work perfectly… so selling it was not an option. So, in my desperation I contacted an expert on Singer Featherweights. His name: Dave McCallum, and after many emails back and forth, he was unable to identify the issue. Dave suggested I contact Glenn Williams, which I did. I had purchased parts from Glenn before. Well Glenn and I went back and forth with the emails as well, to no avail when he asked me to call him. So I called Glenn. I told him I had these two machines, and that I had never had this issue with the black machine. So while still on the phone with Glenn, he asked me to remove the belt off of the black machine and put it on the white one. As soon as I removed the black belt from my black featherweight I immediately noticed something, the black belt was softer and more pliable than the new black belt that had been on my white machine. The new belt was harder, stiffer. Side by side they were the same size. With Glenn still on the phone, I placed the softer belt onto the white machine. With the motor bolt still slightly loosened, I simply let the weight of the motor gently rest on the belt, and then I tightened the motor bolt. The moment of truth…I sat down and ran the machine, and it was perfect! I could now completely tighten the motor bolt, finally securing the motor to the machine without a loss of power from the belt. I just couldn't believe it. It was then that Glenn explained to me that there is an issue with reproduction belts, they simply do not work, and he was right! In all 3 reproduction belts I bought, not one worked! They were all too stiff, being made out of who-knows-what. Before, I was never able to fully tighten the bolt on the motor because it would slow my motor down too much. So if I wanted to sew, I had to leave the motor loose and wobbly, which is not something you want to do at all. Glenn told me he had some used original featherweight belts available if I was interested, well yeah! I bought two. I hope this article has been informative. I know I've sure learned something. Both Dave and Glenn are very helpful people, and I highly recommend them both. Looking for a belt for a 31-15 (only #s found on machine) February 31, 1899 Singer sewing machine. Most repro belts are a little stiff but many times the problem is that they are just over tightened. Also check the width of the belts. Some are way too fat to fit the wheel. The original belts are loose because they are worn out. Singer hasnt made a belt for the featherweight in 30 years. Just be careful when you run them that they don't start coming apart and wrap up on the motor spindle. Belts are made like bias tires, don't run them till they blow out. Also many times your motor is binding and is not running very well if a belt slows it down. Too many people buy ebay machines and run them without a proper service and many shops now just squirting a bit of oil on them and call it a full service. Hi Lamar, being buying an original used featherweight belt, no belt would make the machine run right, and we had tried everything. Once I put an original belt on, it worked fine. I work on machines all the time and this had been the first instance of this, but after talking to a pro in the field, we had narrowed it down to the belt. Thank you so much for this very informative article. I just purchased a white featherweight machine in almost new condition. Unfortunately, it has a replacement tan toothed belt that slips so much that the machine can't sew at all. I suppose that by now Glenn has sold the last of is original belts but I emailed him anyway. Thanks again for sharing your experience with your machine. Hi Kendall, So glad I was able to help. I hope Glen still has the original belts as well. They don't make things the way they use to, that's for sure. 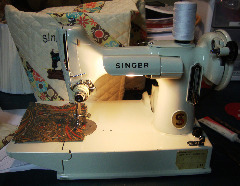 - I just found this by accident (I've been searching for parts and supplies to refurbish my Singer Stylist 543 - by no means an "antique", but the site and info looked interesting). - Anyway, it just seems so odd to me that, with all of the people who do 3D Printing and/or make authentic reproduction materials and parts, and so on, why nobody has gotten into this niche market of making authentic belts, given how much of a problem it seems to be for folks who find their existing machines to be more than adequate, and want to keep them running. this replacement belt problem is finally being resolved. After extensive research, working with Glenn Williams, we have discovered that a Bernina belt will solve this problem. It is my belief that the "reproduction" belts are 1 to 2mm too wide. Hi Tony, thanks for the update, that's great if this solves the issue. Do you have a part# for the Bernina belt? Be sure you ask for the black V belt.